In our daily life in a small town in China’s far flung Northeast, there is a special group of women I have come to appreciate. For lack of a better word, I call them my son’s ayis (阿姨, aunts). They are not related to him, and they are not ayis in the sense of a caregiver, but rather female service personnel looking out for my son. They are the army of women who clean floors, wash beddings, or serve food in the canteen. Usually wearing a white blouse, a black blazer and black trousers or skirts, their work is underappreciated, and they are invisible, a mere small cog in the big wheel. One of my favorite dajies (大姐, “big sisters”) is a woman in her early 40s working downstairs as a receptionist. She wears big round glasses and exhibits a lot of kindness. When she isn’t busy, she likes to read books behind the reception desk. She is also one of my son’s favorite ayis. She treats him respectfully, something he must have sensed from even when he was very little. When my now almost three-year old was a little smaller, he would usually clutch my hand and not talk to strangers, or simply say “不要, I don’t want to” if an ayi he disliked asked if he wanted to play. But he would agree to stay downstairs and play with this one ayi. Once I watched her push him on a rolling chair, both giggling with joy. Another time she let him use her markers to write on the whiteboard behind the reception desk, patiently watching him draw. When at the beginning of spring the weather was finally warm enough to go to a nearby basketball court, I took both my sons there – my baby son stuck to my chest in his sling, my toddler son holding my hand. 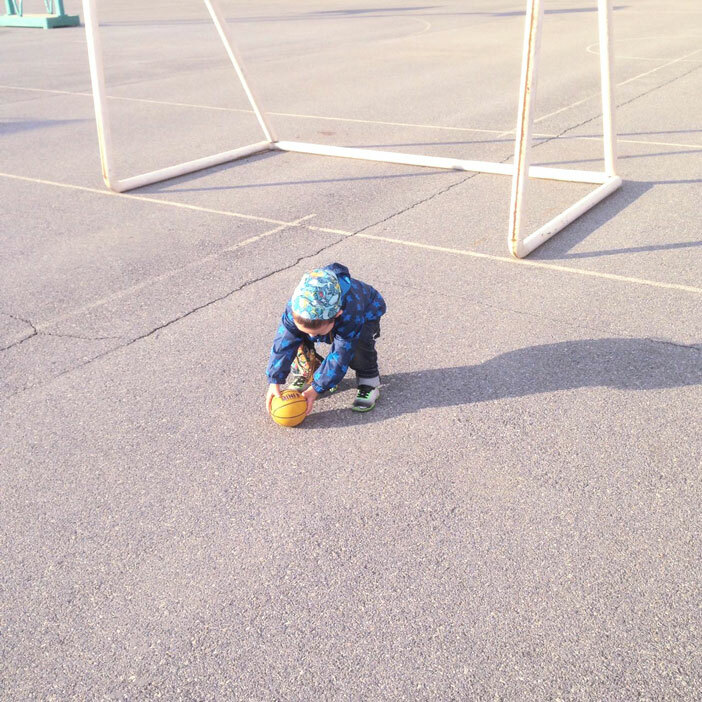 Once at the square, my toddler son started running around, kicking his yellow ball, singing and laughing happily after a winter spent mostly indoors. When we walked back home a little later, a Chinese woman wearing an orange down jacket joined us. She took my son by the hand I wasn’t holding and he let her. She asked him: “Where are you going?” “Home”, he answered without hesitation. My mind was still trying to figure out who she was. Did I know her? Did my son know her from kindergarten? Was she one of his teachers? Or was she a relative of my husband I couldn’t put a name on? She then asked my son: “Do you still remember me?” “I do”, he replied. After she had exchanged a few more sentences with my son, we parted ways with her. Only a little later I remembered who she was. She was one of the women working at the canteen I sometimes go to. I hadn’t been there in a while, and I had never seen her with casual clothes anywhere outside of the canteen before. All of the ayis my son likes have one thing in common: They are kind, they are respectful and communicate with him directly. He can sense pretty well if someone treats him respectfully. While he often ignores people who ask a few questions too many, or states with a loud “不行 (not okay)” if a stranger nainai asks him to go home with her and become her new grandson, he will willingly interact with those who treat him kindly. I love that he gets the chance to spend time with these wonderful women – women who are, unfortunately, often looked down upon here because of their jobs as service personnel. I love the way they interact with him, talking to him directly, taking him with them for a short walk through the canteen so I can finish my meal, or showing him around the storage room in our compound when he decides to go on an inspection tour. Looking out for my son, playing with him, or teasing him all come naturally to them; it even seems as though they were born to do this. And while they would probably not accept my “thank yous” in person, I hope they still know how much I appreciate their attention and help.